Mueller Water Products (NYSE: MWA & MWA-B) was spun out of Walter Industries in 2006. Prior to the spin-off Mueller’s Class A shares were already trading in the market via an IPO. Subsequent to the spin-off Mueller issued Class B shares to the existing shareholders of Walter Industries. The share structure was that 25 million A shares were floated and 85 million B shares were spun-off. Both classes of stock have identical economic value. The only difference was that the B shares came with eight votes per share versus only one vote for each A share. The superior voting rights would suggest that the B shares should command a premium to the A shares. Historically, the A shares tended to trade at a premium to the B shares, typically at a level of 5-10%. The only reason explaining this mismatch was the greater supply of B shares and the fact that there was greater selling pressure on the B shares from Walter Industries shareholders who wanted to monetize their Mueller stake. Additionally, unlike a Berkshire Hathaway, where conversion rights exist between the A and B shares, Mueller has no such conversion rights, so there was nothing to prevent shares from trading one to one. 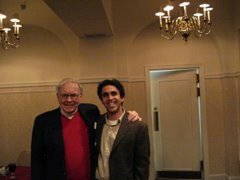 In September of 2008, I noticed that the B shares were trading at $6 while the A shares were hovering around $9, or a 50% premium to the B shares. This was an absurd spread which can only be explained by the irrational market behavior that has engulfed investors recently. The trade was simple: I shorted an equal dollar amount of A shares against a long dollar amount of B shares. Believe or not, there were plenty of A shares to short. Within days the spread had closed to within 20%. My goal was to exit the position when the spread came close to the historical 5-10%. But as luck would have, the company announced that at the next annual meeting, it would put to a vote a resolution to make the A shares convertible to B shares on a one for one basis. The spread closed to within 1% immediately. We didn’t need to conversion announcement to make money but it was icing on the cake. At a 50% spread, the short/long trade was like taking candy from a baby.